The Bridge House is a 20-bed homeless shelter in Plymouth, NH, serving some of New Hampshire’s most challenging individuals, including families, the elderly and veterans. The Bridge House receives about one-third of its funding from town, state and federal sources and the remainder from philanthropic efforts. The Bridge House needed an updated website to show supporters and potential participants the vital work they do for northern NH families and veterans. They wanted to portray a hopeful, helpful place where participants can climb the ladder from homelessness to independence. The old website, built with 1990s technologies, was difficult to navigate and update. It did not reflect the quality program The Bridge House offers and contained out-of-date content on fundraisers, programs and resident stories. The Post Group pulled together a team that offered the writing, graphic design and web development skills needed to create a new website using the WordPress platform. The site’s design and friendly colors represent the hopeful, positive work that The Bridge House does. Easy navigation allows users to find program information, upcoming events, news items, stories about Bridge House residents and information on how to donate or volunteer. And, most importantly, The Bridge House staff can easily post new information. I think the site is fabulous, nicely set up, easy to navigate, very inviting! The Post Group builds sustainable capabilities for nonprofits, including training staff and increasing staff capacity. 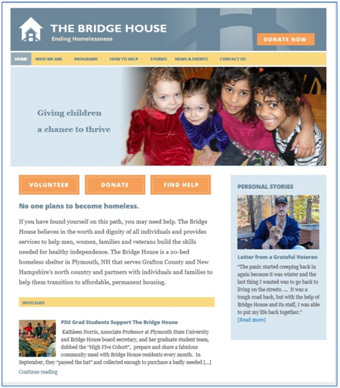 The Bridge House now controls and updates their own eye-catching, informative website that shows off their good work and mission to potential participants, volunteers and donors alike.